Everywhere we turn, these days, there is someone or some charity with a cause. We seem to become almost numb to it - Please take a minute to understand what this charity is doing and you'll see why I am writing this post. It is not just another charity. "[...] it was brought to his [Siears] attention that for families without sufficient funds, something comparable to a small Styrofoam ice chest is offered as the final place of rest for deceased infants. Saddened and appalled by this [...], Bobby decided to do everything in his power to ensure that every infant could be laid to rest in a loving everlasting embrace that would bring some peace and comfort to their families while also honoring the short life of their precious child." That is where it started for Bobby but it quickly expanded to include caskets of seven different sizes suitable for babies of all sizes from Preemie to High School age. I was first made aware of this project when the editor of a local paper called to say that Bobby was limited in his ability to build caskets at the rate they were needed and she hoped that I could perhaps help out with the demand. I was unfortunately unable to help with builds due to prior commitments however her next call was to the Baton Rouge Woodworker's Club found much different results. This local club took the bull by the horns and organized their members to begin building caskets to reduce the strain on Bobby and most importantly to help give some glimmer of consolation to grieving parents around the country. When I spoke to the club's point of contact, Ray McCon, a few days ago he was happy to relay that they are nearly complete drawing all of the models in Sketch-Up for distribution to members. They have also begun new funds raising efforts in the community to help with the purchase of materials. As a father, I simply can not imagine the tremendous grief of burying your own child, your baby boy or baby girl - their age regardless. I know first hand that the Little Angels Foundation has been there for parents in that time of need and they have done so with tremendous respect and selflessness. Do you see why I say this is not just another charity? There is no easement of the pain, to be found in this world, or lessening of the suffering that those parents must endure but Little Angels is helping in a major way. There are many ways that you can assist Little Angels in comforting grieving parents around the country. You can donate directly to the Little Angles Foundation. Donations are tax deductible as the foundation is a 501C Not-For-Profit organization. Donations can also be made in the form of Cypress lumber. Contact them for further details. You can volunteer at fund raising events. See the Foundation's Website for more. You can volunteer to help build the caskets! 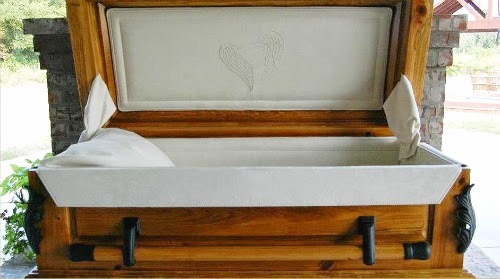 As an individual or organized woodworking club you can receive the casket drawings and start building by contacting the Baton Rouge Woodworker's club. And if nothing else, please take a moment to visit the Little Angels Foundation page or Facebook page and simply say thanks... thanks for caring and doing so much for parents on the worst day of their lives. Most of us can not imagine the sorrow of these grieving parents and some of you may unfortunately know all too well. There are donation opportunities from lumber yards and mills in the way of lumber. Monetary donations are also much needed as there are other items to be purchased - hardware, shipping, and unfortunately these builds will go on for as long as there are craftsmen and women to do so. The Foundation needs your support - whether you can help with builds or help financially. Drop them a line and say thanks for caring and working so hard to keep doing this precious work for families all over the country. Mr Siears is an inspiration to woodworkers everywhere. As a woodworker and as a father, thank you, Bobby. The material found herein is the sole intellectual property of it's author(s).